Daniel Crump / Winnipeg Blue Bombers. 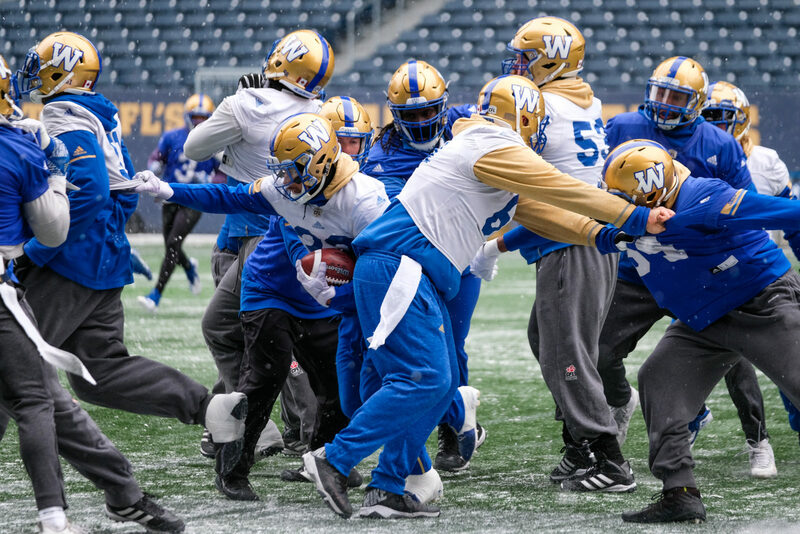 Winnipeg Blue Bombers PracticeNovember 7, 2018. The crowd of media was bigger, and so too are the stakes now. And so when Winnipeg Blue Bombers running back Andrew Harris stepped in front of a row of cameras and reporters on Wednesday – the first day of practice in advance of Sunday’s Canadian Football League West Division Semi-Final against the Saskatchewan Roughriders – there were a lot of topics to hit on from a variety of different voices. There was the matchup with the Riders, a classic showdown between long-standing Prairie rivals. 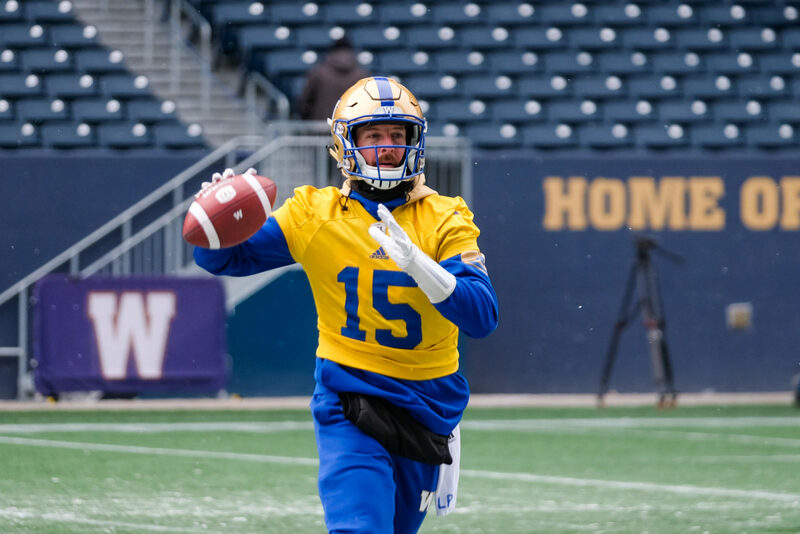 There was Harris being named to the West Division All-Star team again, along with six of his teammates – offensive linemen Stanley Bryant, Matthias Goossen and Sukh Chungh, wide receiver Darvin Adams, linebacker Adam Bighill and safety Taylor Loffler. There was the weather, what with the snow falling and the mercury dropping. But it was near the end of his long give-and-take with the media when the veteran running back hit on a subject which might be the most important big-picture take in advance of Sunday’s tilt: The window of opportunity might not be open for that much longer for this squad, not just because the core which has been together for three years is getting older, but also due to the uncertainty this offseason will bring with an expiring collective bargaining agreement. “The whole league is going to be different,” said Harris. “There are some crazy number like 70 percent of the league is going to be free agents or something like that. I don’t even know if that’s true. But for us, I know there are a lot of free agents out there, everyone’s going to be going to different places, so absolutely, any team that’s in the playoffs right now that cares about their team is thinking the same way, that winning with that team is going to be special because all the teams are going to be completely different next year and a lot of guys know that. 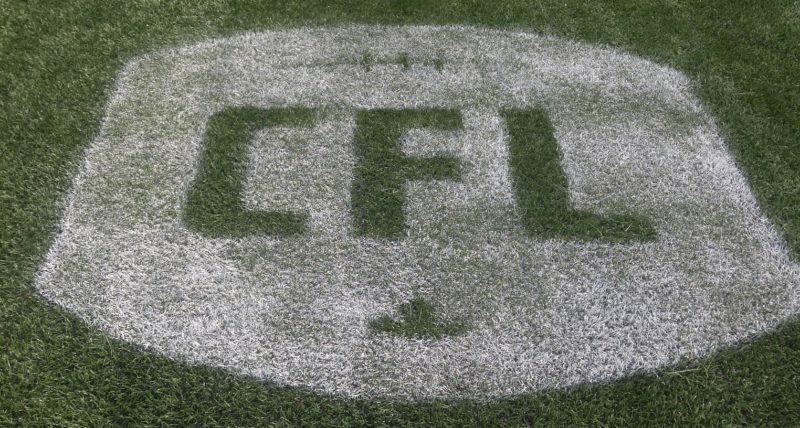 Now, we must point out that last take came after Harris repeated the Bombers mantra of going ‘1-0 this week’ and insisting they are not looking past the Riders to Calgary in the West Final or to the Grey Cup. These guys have been adhering to a strict code of respecting the process, as dull as that might sound now with more eyeballs on them in a playoff push. But there is also a sense of urgency with this bunch, a group that talks often about the ‘room’ and their camaraderie. That’s why this Sunday, and what might come after that, is so important to them. The Bombers roster features 13 players 30 years of age or older, and that group are starters and West All-Stars like Harris, Bighill and Bryant, along with regulars Matt Nichols, Weston Dressler, Anthony Gaitor, Chris Randle, Kenbrell Thompkins, Maurice Leggett and Justin Medlock, as well as Jeff Hecht, Frederick Plesius and Chad Rempel. Each of those men will all spend this week focusing on the little details they need to get done individually and collectively to get help chase a win on Sunday. But they might also take a moment to sneak a peek around the locker room before the playoffs and wonder how much different this squad will look next spring. 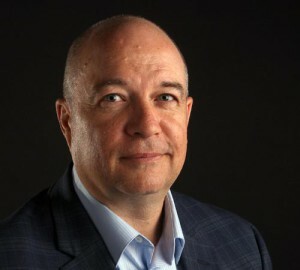 All of that, coupled with the relative health of this team heading into the playoffs – especially compared to this time last year when Adams, Leggett and Jamaal Westerman were all out, with Nichols operating with a bum hand and calf and Dressler playing with a broken hand – has only cranked up the expectation level in the Bomber room. The practice Wednesday was the Bombers first session in advance of Sunday’s Semi-Final. 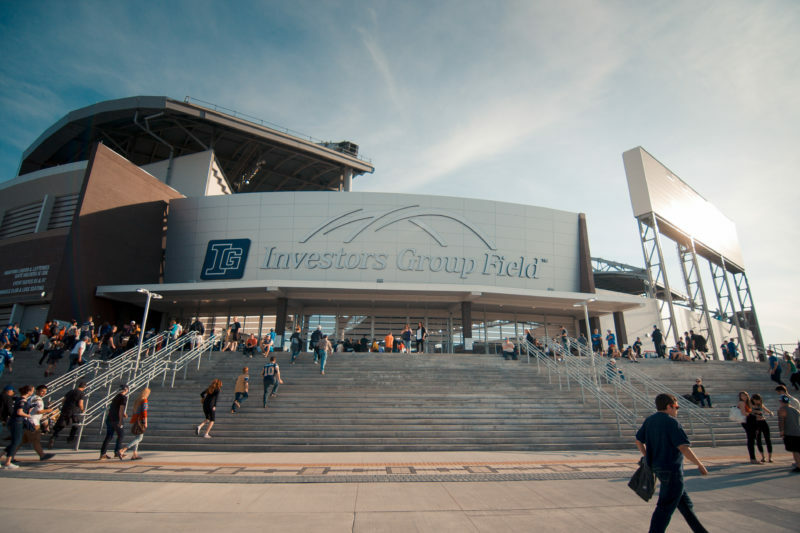 And in the next few days, there will undoubtedly be a lot of chatter about the club’s need to take another step in its evolution. After all, this is the club’s third straight playoff appearance after climbing out of the abyss that was 2012-15. But it’s also seeking its first playoff victory since the 2011 East Final. 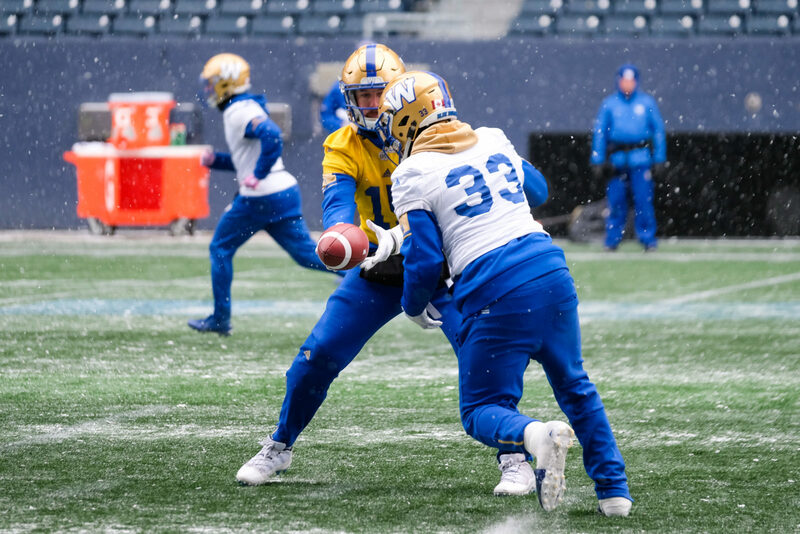 The Bombers practised Wednesday minus LB Jovan Santos-Knox and with DB Marcus Sayles dressed, but getting limited work. 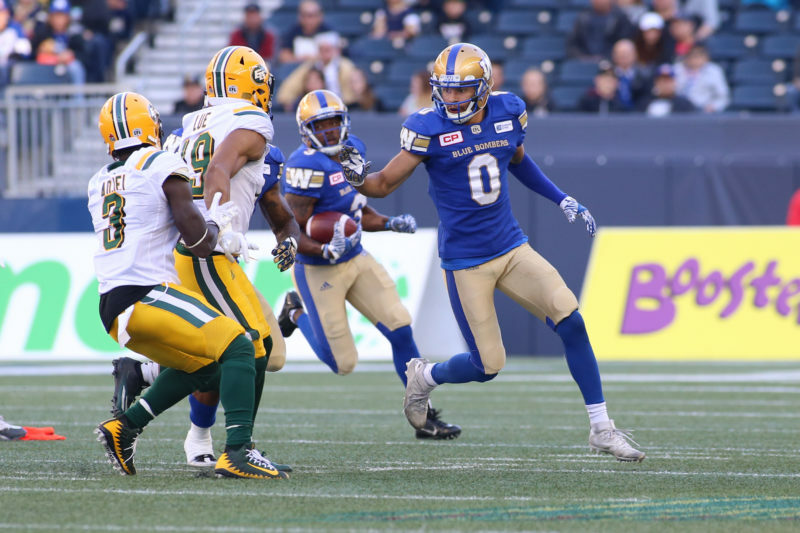 Bombers head coach Mike O’Shea would not rule out Santos-Knox, but did add that Sayles should be good to go. Chris Humes took more reps in the secondary, while Ian Wild and Kyrie Wilson are available if Santos-Knox can’t go. That relatively positive health report is a far cry from last year, as touched on above, and has given the Bombers a different sense of confidence this season. “Way better. Obviously, myself I feel a lot better. I was dealing with a couple of things last year. This is as good as I’ve felt at the end of a season since probably 2012 when I was only playing spot duty here and there. I feel great. As a team, you look across the board and how healthy we are… it’s always something we talk about and it’s kind of key to winning championships up here. It’s the teams that gets hot at the right time, which I feel we are playing some good football, and the teams which stay healthy, which we’ve done a good job – Coach O’Shea and our training staff have done a good job of making sure guys are constantly in there working out and taking care of themselves. One more from Harris… he might not have all of his teammates on board with him, but he was all smiles after a frigid practice Wednesday when asked about the weather conditions. Goossen lives in Winnipeg year-round and is always volunteering his time.